Animation Is Film is a brand new event that will bring the cream of animation talent from around the world to LA next month. The inaugural edition of the festival (organised by GKIDS Films, Annecy International and Variety) will take place October 20-22 at TCL Chinese Theater, Hollywood. Tickets have now gone on sale, and the full slate has been revealed. A total of 12 films will screen in competition (with both Juried and Audience Awards). In addition to the already announced films, anime feature Fireworks, French/Japanese co-production MUTAFUKAZ and Tropical Virus have joined the line-up. Night Is Short, Walk on Girl has also been added, which means, incredibly, that Masaaki Yuasa has two films in competition (the other being Lu Over The Wall). Several of the screenings will be accompanied by Q&A with the filmmakers. 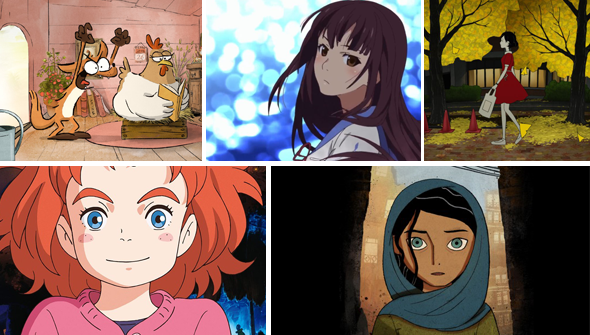 The Breadwinner's Nora Twomey, Mary and The Witch's Flower's Hiromasa Yonebayashi and Big Bad Fox And Other Tales directors Patrick Imbert and Benjamin Renner will be among those attending. There are a number of other special events happening including a preview of Pixar's Coco, a special anniversary screening of Snow White And The Seven Dwarves and a program of classic shorts, as well as a VR lounge. Finally, the full Jury has also been revealed. Brenda Chapman (original director of Brave) is among those added to the previously revealed names. This is an incredibly impressive line-up, especially for the first year of a new event. We can only imagine how it could continue to grow in future years. If you are in or around the LA area, this looks like something not to be missed. For further details and tickets visit the festival's website.